One of the neat aspects of residential solar power, beside the obvious benefit of being able to generate affordable clean renewable electricity, is the ability to make power production (and consumption) more transparent to the homeowner. Through web interfaces, and now with mobile solar apps, solar homeowners can track the exact amounts of electricity produced by their system, both in real-time and over longer periods (month to month or week to week), which not only allows them to better understand their own energy ecosystem for increased energy efficiency, but can also serve as a way for them to be solar evangelists in their community. Another component of the solar app is a feature called NearMe, which is an interactive map of other SolarCity projects in the area, which can be used either at home or while traveling. Seeing where other like-minded solar enthusiasts are could help build a stronger sense of community among clean energy advocates, especially when viewed on a larger scale. In addition, a private photosharing app, called AmpIt!, offers a place for solar homeowners to connect and share their experiences with power from the sun. And if you’re the person who’s always talking up solar energy to other people, the app can be used to promote clean power as a Solar Ambassador and earn money when you refer a solar customer to the company. 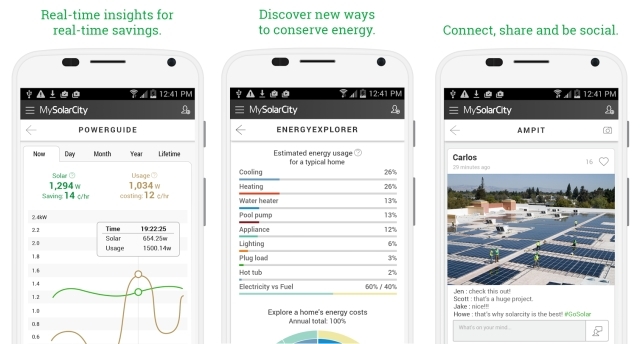 MySolarCity is a free download for Android and iOS, and can be accessed on the web by SolarCity customers as well. Find out how to go solar today!